Presented by Harry Hogg. Sponsored by Brandwatch. Pathfinding is a concept that we all encounter in our day to day lives. In software, like SatNavs planning the quickest route to a destination or utility companies installing infrastructure in the most efficient way possible. In our own brains, from a premeditated route to the train station or a split second decision of your next step to avoid a fellow pedestrian. Each of these decisions have obstacles that must be avoided and have a certain cost associated with it, be it fuel, money, time etc... Pathfinding is the problem of finding the best path from a starting point to a goal, taking into account these factors. 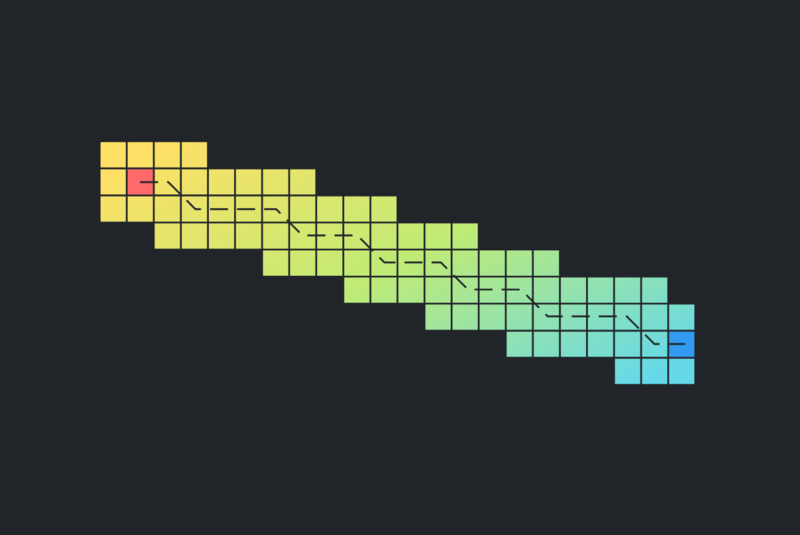 Come down for a light hearted competitive game of writing your own pathfinding solutions using an online visual environment with the classic game of Snake. Bring a laptop if you can, but we’ll be forming into teams so come along even if you don’t have access to one. All levels of coders are welcome, as the approach is just as important as the code itself. This meeting will be sponsored by Brandwatch, who will provide pizzas and beers for all. Please get in touch if you have any specific dietary requirements at hello AT asyncjs DOT com.